This is unexplored territory for me… white. It’s one of those nail shades that suddenly become “bang on trend” and throw everyone into a fizz of polarised opinions on how great/terrible it looks! 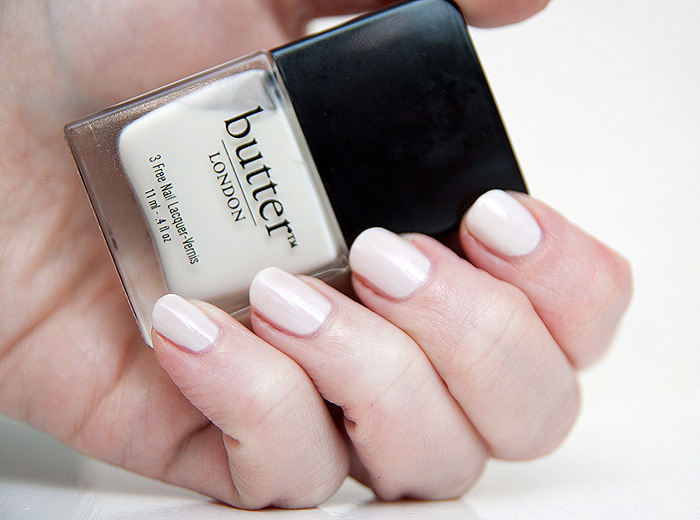 Butter London’s Cream Tea isn’t a pure, stark white. As the name might suggest, it’s a slightly creamy white that would work nicely for the tips in French manicures were it not so sheer. The above shows three coats and there’s still a certain veil-like quality to the finish. I’m on the fence… I think it’s one of those shades you appreciate more freely on someone else’s fingers than your own. What say you? Do you ever wear white or off-white polishes? I think this looks gorgeous on you. I’m after this for sure! Ha, I love it when you find use for a product I own but don’t use! I somehow acquired Nails Inc Floral Street (the tip colour in a French kit I think?) and have wondered if it’s any good for full nails. But this seems less Tippex-y – Floral St goes from massively streaky to fully opaque (and matte and chalky). I kind of like that the Butter version isn’t totally opaque. Bit jealous as I know it doesn’t suit me as well. If I find this cut-price I’ll surely get it. This would probably look weird on me. Great on you, though! Beautiful! it works with your pale skin. Shame it’s sheer, how perfect it would be for french manicures! I think it looks quite sophisticated on you! Not sure how it’d look on my skin tone though, but it’s very pretty & I like the glow it has. I agree with Jamilla regarding the polish. I think the color actually suits your skin tone well, but I’m not sure how it’d look on anyone less pale. I think it looks lovely on you, I’m almost tempted to reconsider wearing white polish myself!